A large but traditional Tyrolean village below one of Austria's greatest and highest ski areas, crossing the border to be linked with Samnaun. When will it snow in Ischgl? The next notable snow forecast for Ischgl is 6cm2in, expected on 23 April, with around 9cm4in forecast over the next 7 days. The Austrian Ski Resort of Ischgl is part of the Silvretta ski area with access to 480km298 miles of downhill skiing, with 145 marked pistes, served by a total of 101 ski lifts. In addition to the skiing in Ischgl itself (200km124 miles of pisted ski runs), the appropriate ski Lift Pass will allow you to ski or snowboard in the other Silvretta ski resorts of Galtür, Kappl and Samnaun. Ischgl is directly linked by Ski Lift to the ski areas of Samnaun. With ski lifts as high as 2,900m9,514ft, skiing and snowboarding is assured throughout the season. Ischgl is a large but traditional Tyrolean village below one of Austria's greatest and highest ski areas, crossing the border to be linked with Samnaun since 1978, making a unique Austro-Swiss ski area. Considering its status today as one of the best and largest ski areas in the Tyrol, Ischgl has been something of a late developer. It survived as a predominantly farming community despite hardship causing increasing migration until the late 1950s, with the first cable car opening in 1963. Indeed Ischgl's current success is a remarkable turn-around for a village which once had to send its children over the border to tend cattle in order to make ends meet, a practice so common that the children were even given a name, 'Schwabenkinder'. Although there are now more than 9000 tourist beds, making this one of Austria's biggest resorts, the local population remains below 1500. The 200km (125 mile) ski region is one of the largest in Austria (at least partially) and with a vertical approaching 1400m up to 2872m it is much higher and bigger than some of the country's other big name ski areas like Kitzbühel. Ninety per-cent of the ski area is above 2000m making this a particularly snowsure area with a long season, traditionally culminating in a big 'top of the mountain' concert at the end of April, which in the past has featured some big stars like Elton John, Tina Turner, Bob Dylan and Diana Ross. The concert and many other aspects of the area such as its status as a snowboarding mecca all contribute to make Ischgl one of the coolest resorts in the Alps. The resort's more recent developments have lead to Ischgl being one of the best designed ski areas in Austria and indeed the world. 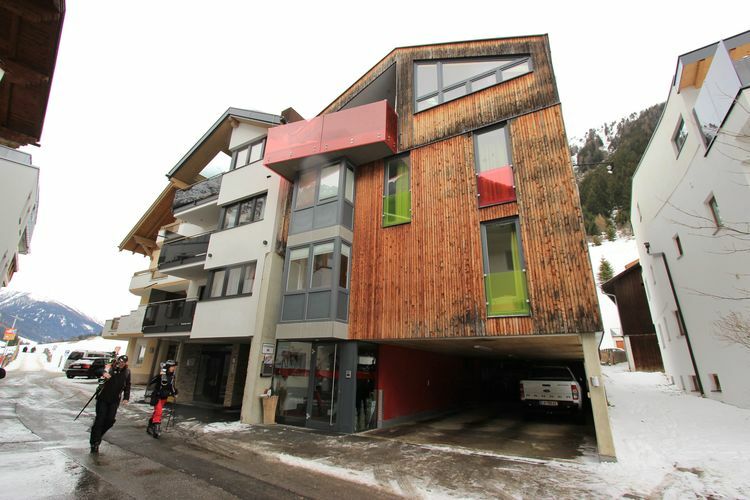 It has hi-tec lifts, including a funitel (ultra-stable high-capacity gondola running on two cables rather than the usual one) and a double decker cable car rapidly accessing the slopes, and slopeside lodging offered by many properties. Although customs regulations between Austria and Switzerland are described by the resort as 'lax', you should still carry your passport as customs official have the right to check it, and observe shopping 'import' restrictions when returning from the duty free shops of Samnaun to Austria and the European Community. The longest possible descent in Ischgl is 11km7 miles long and the most difficult run is the 'Nordabfahrt (4)'. Ischgl's huge high ski area, the largest in the Eastern Alps, is easily accessible from the village centre with a choice of three gondolas to take you up to the high altitude skiing above. The slopes directly above the resort are north facing and have snow making so, with the fact that Ischgl is in any case higher than most Austrian resorts, it means you can normally ski back to the village from the start to the finish of Ischgl's long season. The resort does not have any real resort level nursery slopes and beginners take the gondola up the mountain to a snowsure learners' plateau. The gondola is now easy to reach with a tunnel to the base station from the village centre and the altitude beginner area at least means you can be sure of the right type of terrain to learn on. It's quite common in Austrian and Swiss resorts with only village level nursery slopes for beginners to have to start on slopes steeper than the ideal up the mountain for much of the season if resort level snow is inadequate. Intermediates will enjoy the Silvretta ski arena the most which opens up six valleys and the exciting feeling of skiing over the border to Switzerland, making use of some very hi-tec uplift technology in the process. The runs include long wide open cruisers of up to 7km (over 4 miles) in length. There are high alpine bowls and fun runs down through the trees. Although there are 200km (125 miles) of linked skiing between Ischgl and Samnaun almost double that amount is available on the Silvretta Pass which also includes neighbouring but not lift-linked Austrian ski areas at Galtür, Kappl and See in the Paznaun. The total is 370km (232 miles) of trails served by 66 lifts and a free ski bus linking the various area. Experts have ten trails graded black in the region, with a total length of 40km (25 miles), a fifth of the terrain. The resort's single ski school leads off piste and powder expeditions. There is also has extensive cross country skiing with 48km (30 miles) of prepared trails including loipes at all ability levels. Ischgl offers good sking, particularly, for Expert and Intermediate skiers. Ischgl is without doubt one of the world's snowboarding meccas where the terrain and the attitude of the resort - to 'boarding and to life in general - come just right. This was the location of the first ISF Snowboard Championships held in 1993, and the Snowboard Masters the following season. Three World's Series were staged from '95 to '97 and the Ballantynes Halfpipe Grand Prix in April '98. An FIS Snowboard World Cup was staged again in December '98 and has been scheduled annually. The 'boarders paradise is divided in to four areas with 30 obstacles and there's a permanent 90 metre half pipe. Carving fans can enjoy their own carving slope, served by the Idjoch chair. The funpark consists of five jumps, four straight jumps, three high jumps, one quater-pipe, one fun box, one WM Halfpipe (The Tube), four rails, two waverides, one boardercross, one riesentorlauf and finally, a kindercross. We don't currently have confirmed season dates for Ischgl. NOTE:- Lift and Piste openings are always subject to Snow Conditions in Ischgl. Ischgl is able to make snow, on 200km124 miles of ski runs, with 1100 snow cannons. The 42 ski lifts of Ischgl are able to uplift 73,255 skiers and snowboarders every hour. Ischgl is in the Austrian Alps in Landeck, Tyrol, Austria. The nearest airports to Ischgl are Innsbruck Airport, St. Gallen-Altenrhein and Friedrichshafen. There are eight airports within three hours drive. The Webcams in Ischgl are not always up-to-date. Please check the date on the image to ensure you are seeing current snow conditions. Ischgl has a very lively nightlife reminiscent of its neighbour St Anton, a few miles away over the mountains. There is the same cosmopolitan mix of international guests although the over-riding theme is more Germanic here, compared to the strong British presence of St Anton. More than a dozen bars are lively as soon as the lifts close and more than thirty are on offer once the evening is in full swing. Slopeside open air socialising is possible at a number of venues, notably the Marends at the hotel Elizabeth, the Sonne where there's often live music and for country and western, it's the Buffalo in the Hotel Grillam. Other popular places throughout the evening include the Allegra American Bar in the hotel Tscla, the Guxa cocktail bar and Niki's Stadl in the Piz Buin hotel; there are many more. The three discothèques are the Club Après in the Hotel Central, Feuer and Eis (Fire and Ice) and Madlein Wunderbar. Other evening activities include swimming, tobogganing, bowling to 1am (closed on Saturday nights) film and theatre shows. Want to Know when it Snows in Ischgl? 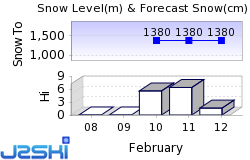 Click above to get Snow Reports by e-Mail for Ischgl. By doing so, you agree to Our Rules. Other Ski Areas within Silvretta. Other popular Ski Areas near Ischgl. Want to ask about skiing and snowboarding in Ischgl? Or contact Ischgl Tourist Office. Note :- The information on J2Ski concerning Ischgl, where not clearly factual, is opinion only and is neither definitive or exhaustive.